Yeah, you read that right – a cat acrobat show. 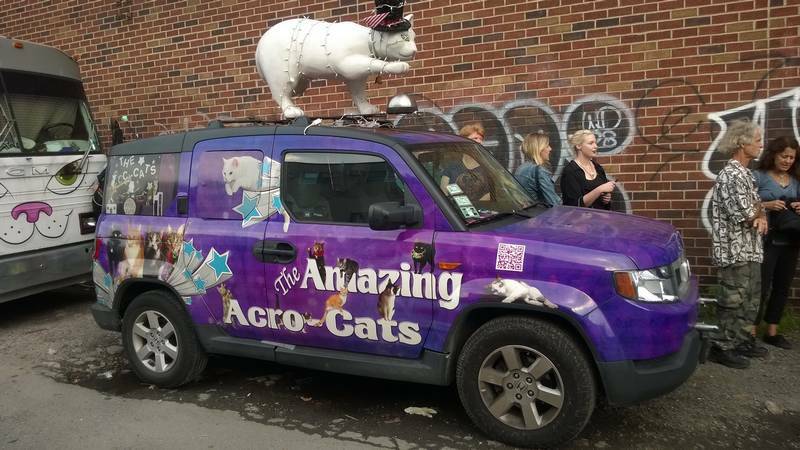 The Amazing Acro-cats is a small circus troupe of cats and other domestic animals by animal trainer Samantha Martin. Her animals are clicker trained and they go back to their cages when a whistle is blown. Most are her pets but some cats are fosters and available for adoption. All the animals are rescues and strays. She wants to inspire people to clicker train their cats. She even explains how this can be handy in emergency situations like when you need to find them quickly if there’s a fire. Victor and I get real lazy to go to Williamsburg, Brooklyn. That’s really far by train from Bay Ridge, Brooklyn but for a cat show, I just had to see it. There was no way I was going to miss this show. So we journeyed even farther into Brooklyn. All the way to the Muse in Bushwick to see The Amazing Acro-cats and Rockcats. You can even meet the stars after the show. We didn’t know what to expect. It was cute and entertaining. For me it was great. I wouldn’t mind seeing it again. Samantha and her furry crew travel around the country nine months out of the year teaching us about clicker training and how “cats will work when paid while dogs give it away for free”(as quoted from the show). Posted on July 25, 2015 by jebusandandrea	This entry was posted in Cats, New York, NYC, USA and tagged Animals, Brooklyn, Bushwick, Cat Show, Cats, Cats in Costume, Caturday, Companion Animals, New York, NYC. Bookmark the permalink. I saw a segment about them on a TV news show. I’d love to see them. So glad you got to go. Had to see it! It was interesting. I checked their website and they have a partial West Coast tour already scheduled for next year so I’ll keep watching. Right now the closest is Portland Oregon which is about a four hour drive and an overnight stay so….needs to be closer. Forgot to say. If you do see the show in the future go 45min ahead. We got there a half hour before (General Admission). Our seats were ok. 45 min ahead should get you closer to the front. Some acts are done on the stage floor so if you don’t have an aisle seat, it’s hard to see. IMHO, anyone would want to see this circus act! Oh my, what smart cats – training cats is not easy! 🙂 It must be very entertaining! Cat acrobat show? I have never heard of anything like it but I would definitely go see it! It was fun! Didn’t know what to expect. Def, a cat person kind of thing. If you go, go 45 min. ahead. It’s general admission. We had an aisle seat near the middle. It’s hard to see some things. If you go earlier you’ll be closer to the front.